Group discussions are a very important part of placement tests and all entrance exams. 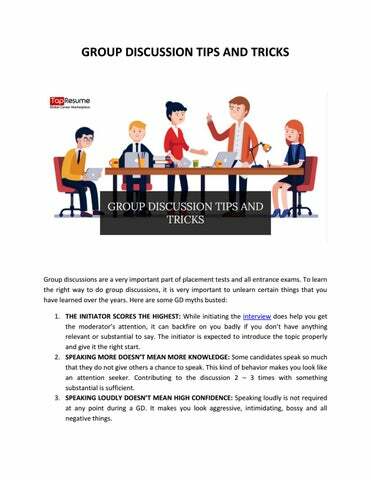 To learn the right way to do group discussions, it is very important to unlearn certain things that you have learned over the years. Here are some GD myths busted: 1. THE INITIATOR SCORES THE HIGHEST: While initiating the interview does help you get the moderator’s attention, it can backfire on you badly if you don’t have anything relevant or substantial to say. The initiator is expected to introduce the topic properly and give it the right start. 2. SPEAKING MORE DOESN’T MEAN MORE KNOWLEDGE: Some candidates speak so much that they do not give others a chance to speak. This kind of behavior makes you look like an attention seeker. Contributing to the discussion 2 – 3 times with something substantial is sufficient. 3. SPEAKING LOUDLY DOESN’T MEAN HIGH CONFIDENCE: Speaking loudly is not required at any point during a GD. It makes you look aggressive, intimidating, bossy and all negative things. group discussion. You can simply jot down your points on a notepad which will help you to stick to the topic of the group discussion. Group discussions have become an easy and effective tool to eliminate unsuitable candidates from the selection process. Keep all these points in mind and you will be able to nail your group discussion round.